“For Leeds, good growth means more jobs and homes; improved skills and educational attainment for all; helping people out of financial hardship and into work; and increased inward investment” said Leeds City Council in 2015. I often wonder if the council and our city is serious about that ambition. And I wonder how the city is doing. Leeds has fewer really poor areas than similar cities like Birmingham and Manchester. Despite an incredibly challenging environment and a recent increase, it still has the lowest rate of homelessness of any core city. And Leeds has built homes at a rate needed to keep them affordable. London’s housing crisis is not Leeds’. In the Joseph Rowntree Foundation’s inclusive growth monitor report Leeds LEP finished equal with Sheffield and ahead of Manchester, Birmingham, Newcastle, Liverpool, and London for economic inclusion. 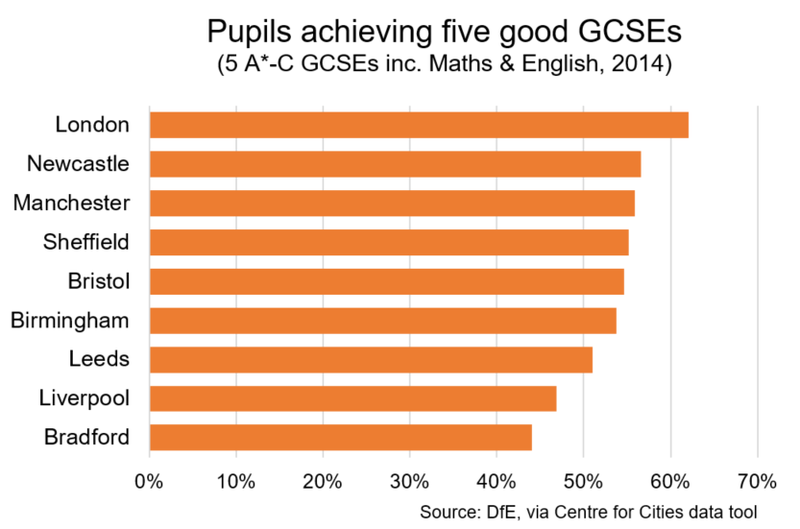 But whatever comparative success Leeds has had on economic inclusion is not an excuse to stop trying to improve. Especially because in some areas Leeds does poorly. Leeds does better than most cities at attracting and retaining highly-trained people. But it does badly at educating its own young people. Children in Leeds and Bradford do worse at school than children in most of England’s major cities. We must improve that. I also think that Leeds and its region suffers from unacceptably poor transport. The city may attract investment and create jobs but if people cannot get to them then they are excluded from success in the most obvious way possible. It is an ominous sign that between 2001 and 2011, as Leeds grew, the population of its travel to work area fell. We can’t be sure why, but it seems likely that poor public transport, and increasing congestion played a key role. Leeds is already doing a lot of the right things to help create the jobs that people need to succeed. The plan is working. More and better jobs are being created. But it’s clear to me that we can do better at making sure everyone in the city has a great chance of getting them. That means improving education in the city. Investments like the Ruth Gorse Academy, The Printworks Campus of Leeds City College, Leeds University Technical College, and Leeds College of Building Hunslet campus are part of that. We can do even better. It also means improving transport within Leeds and between Leeds and its close neighbours. After decades of setbacks, Leeds has real challenges in this area. The current transport plan might be a step in the right direction, but I think that we need to do much better in the future.